As I mentioned in last week’s post, after typhoons Haiyan and Yolanda devastated the Philippines, Leigh Reyes sprang into action and organized “Pens For Aid”, an online auction that raised funds for the Red Cross relief effort. 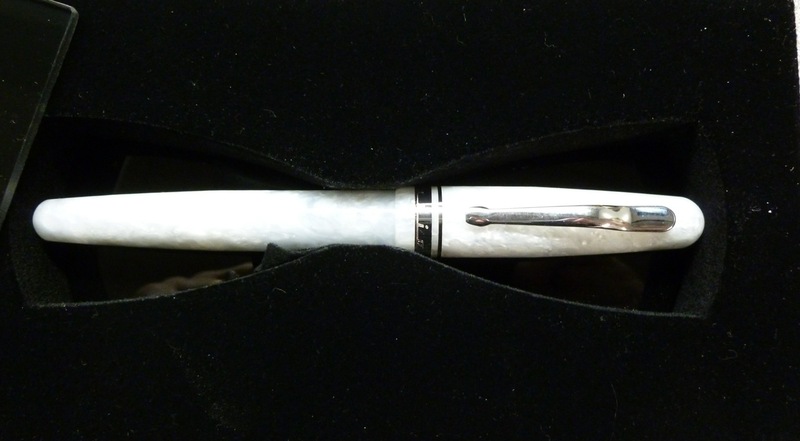 New and vintage pens were donated by private folks and retailers, and pen lovers placed their bids and crossed their fingers. Leigh, herself a resident of the Philippines, used her passion for pens to help the Red Cross help those who were, and are, hurting. What a super idea. 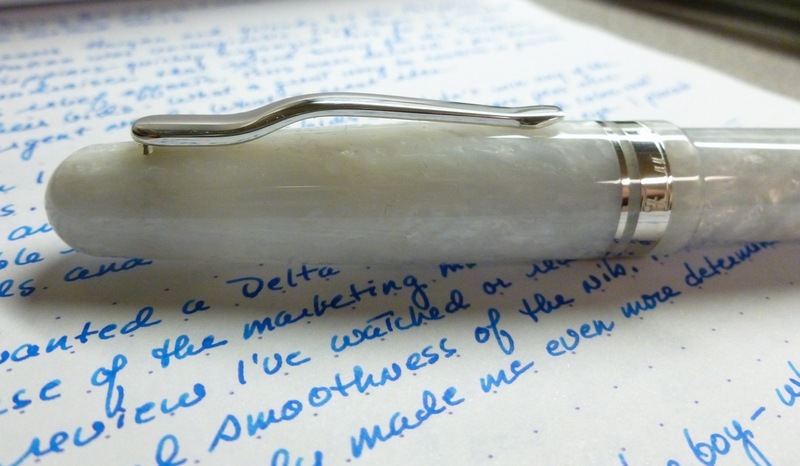 I’ve wanted a Delta Fusion 82 for some time now— not because of the marketing mumbo-jumbo— but because every review I’ve read or watched makes particular note of the VERY SMOOTH nib. That’ll get me every time. 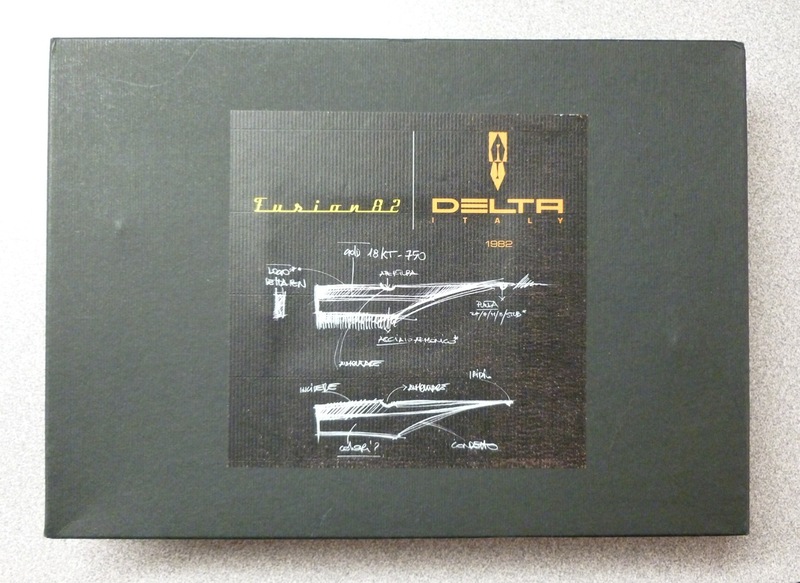 So when a WHITE Delta Fusion 82 popped up in the auction, I settled in for the long haul. The white body isn’t available in the US which made me more determined to win that pen. And win it, I did. Hoo boy— what a pen! 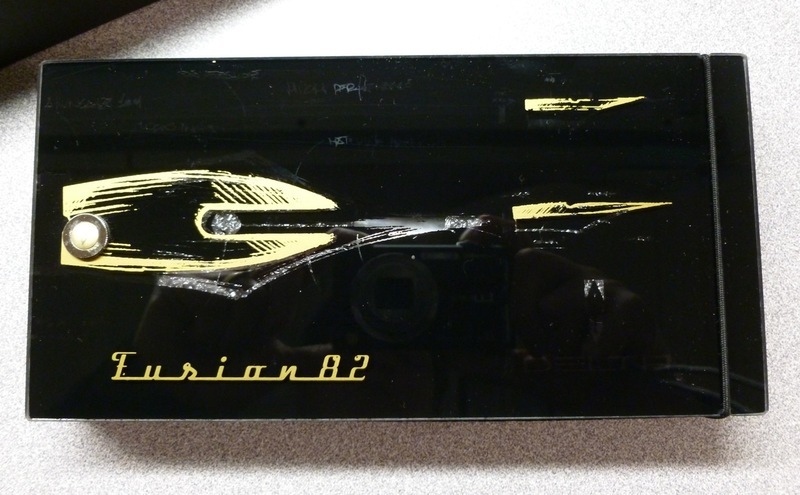 Even the packaging is very cool. 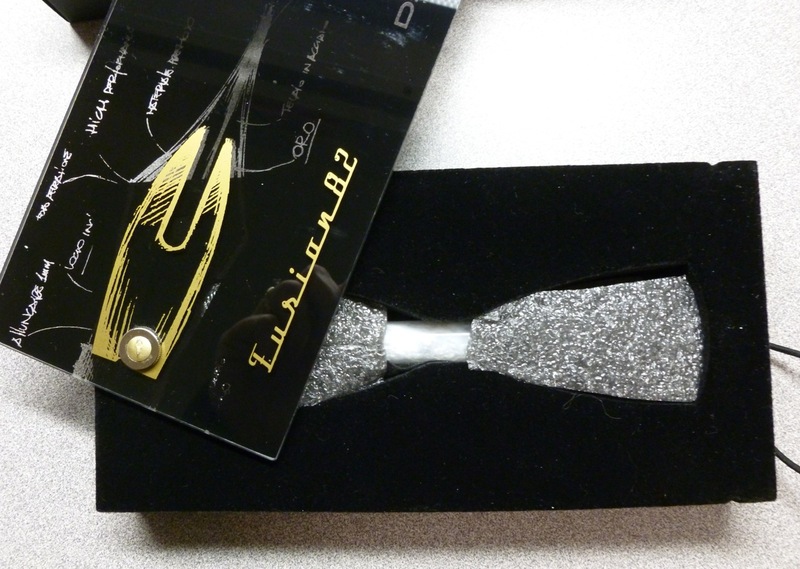 Inside the outer cardboard box, is a slick inner box with a plastic lid that swivels open to reveal THE PEN. Let me say that none of my photos do this pen justice. It’s gotta be the whiteness. I just can’t get photos that convey the very cool, cracked ice, look of the body. The acrylic shimmers with depth and is just a little bit translucent. If I look hard, I can catch a hint of the Iroshizuku kon-peki that’s loaded up in the included converter. 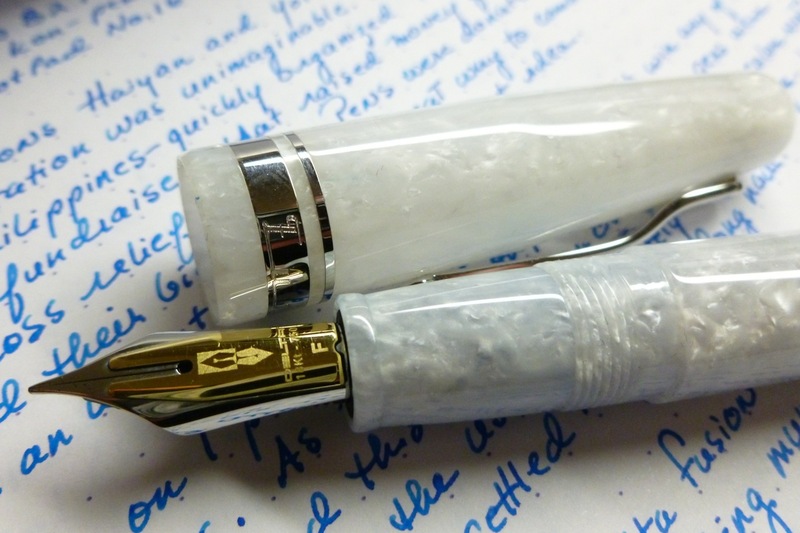 Because this pen is white does NOT mean that it’s boring. Quite the contrary. The clip’s a pretty tight one, but has a lovely profile. 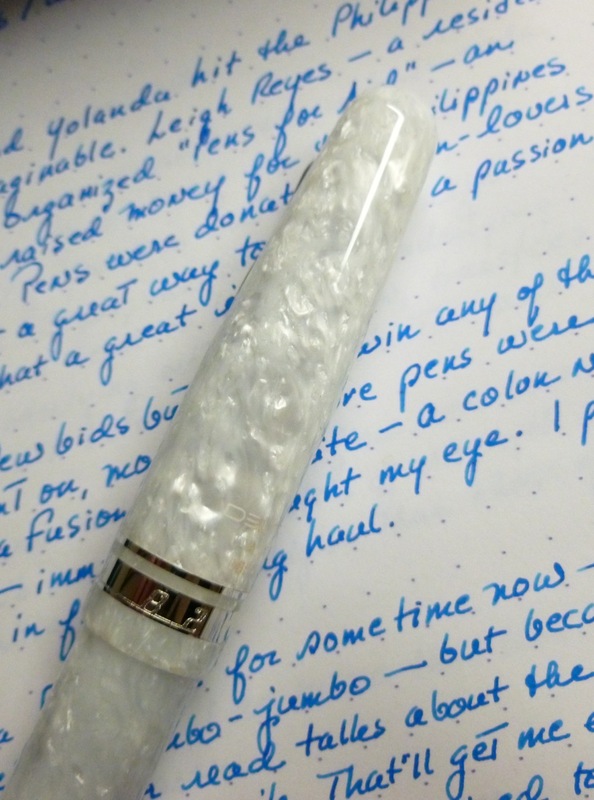 But where this pen REALLY SHINES is in the nib. Oh my, that nib. 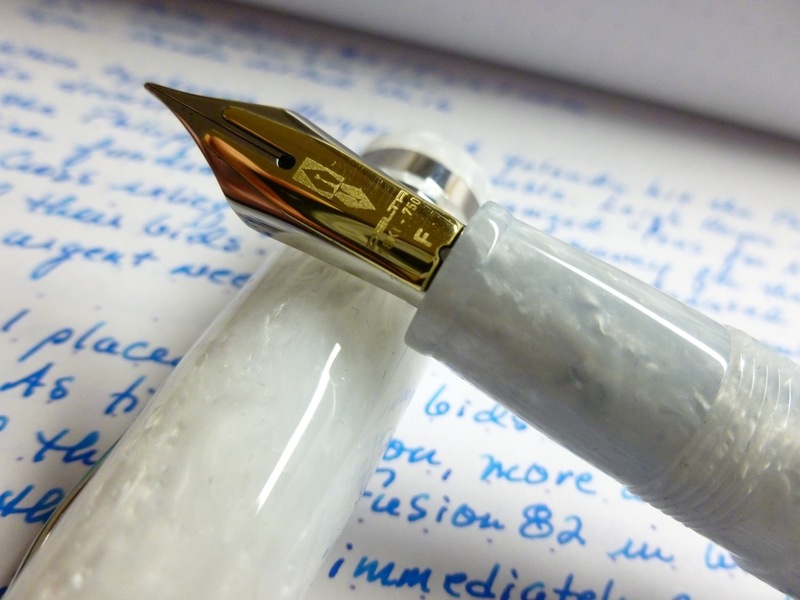 Thanks to the production characteristics, the ink is made more fluid in the vicinity of the tip of the nib, because Fusion features a “plate” of precious material (gold, palladium, or other noble alloys), that due to its high thermal conductivity, will tend to heat the underlying metal (steel, titanium, or other) and the underlying metal, in turn, transfers heat to the ink in transit between the conductor and the tip of the nib. The higher temperature makes the ink flow more smoothly. At the same time, the nib has characteristics of strength and durability for long writing sessions, higher than those of nibs completely in gold. Truth? Proven? Who knows. I DO know that this is one of the sweetest, smoothest nibs I’ve ever used. So maybe, just maybe, they’re onto something. I’ve been using this pen every night to write in my journal— a new habit for 2014, and one that I’m enjoying— and can’t seem to make myself use a different pen. It’s crazy good. Is there anything I don’t particularly like? Well, as I said, the clip is quite tight, but since I’m storing the pen in its very distinctive box, not in a pocket or case, this isn’t an issue for me. Also, the cap doesn’t post, but it’s perfectly fine in my hand unposted, so no worries there (for me). The crackly cool look of the body and the juicy flow from this heavenly nib easily override what could be seen as “flaws” by some. Is there hocus-pocus going on between the gold and steel and ink? Maybe. Maybe not. Does this pen write like a dream? Absolutely. I thank Leigh for organizing and handling all aspects of the “Pens For Aid” auction, and for throwing in the amazing goodies that I showed you in last week’s post. 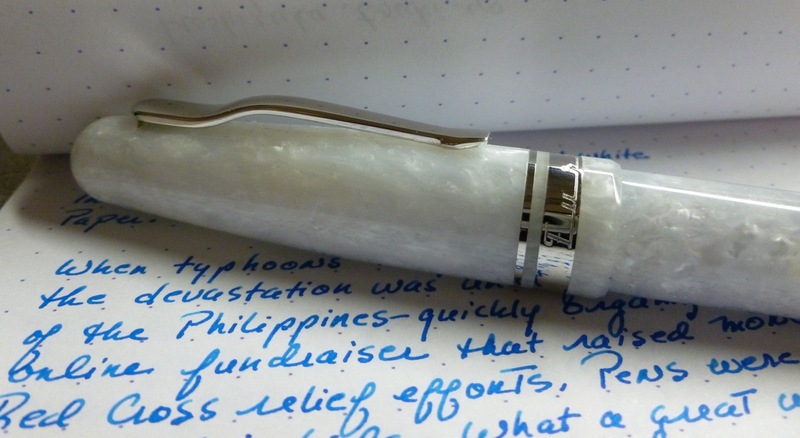 She is a generous soul, and an inspiration for pen lovers everywhere.